After a video went viral of an AU student using the n-word in an Anderson Hall lounge, students are calling for the University to create a safe space and housing options for black students. A petition titled “Petition for Black Spaces at American University” quickly circulated around on social media after it was posted on April 9. Within 42 hours of its initial posting, it gained over 700 signatures, said Eric Brock, the freshman that created the petition. “I just felt like we could really use the support of allies on campus after the events that occurred on campus specifically because the situation did happen in the dorms,” Brock said. Currently, Brock serves as a co-chair of the Student Advisory Council on President Sylvia Burwell’s Council on Diversity and Inclusion. He said he and other students have had conversations about creating housing for black students with AU administrators before this incident occurred. Lisa Freeman, the director of residence life, said in an email that she was talking with her colleagues about the idea. “Just last week, my colleagues in housing, the Center for Diversity and Inclusion and the Assistant Vice President of Diversity, Equity, and Inclusion [Amanda Taylor] met with identified students to discuss my findings and to engage current students on what type of community space they would like to see formed,” Freeman wrote. Freeman said it’s possible AU could create affinity group housing for black students. She added that AU has previously offered affinity group housing with social justice themes. Brock cited models of nearby universities as examples of possible ideas. Georgetown University designates a house for about five residents who organize programs, events and dialogue for students of color. George Washington University provides spaces in dorms for different groups such as women of color and first-generation students. “I think the organizer of black students and what they need on campus will come out of a place of refuge, a place to organize, a place to be themselves,” Brock said. While there have been conversations about the types of models they are looking at, there is no concrete vision or plan yet, said Consuelo Grier, director of multicultural student support. Tamir Harper, a freshman and member of the Student Advisory Council for the Council on Diversity and Inclusion, believes that these spaces would be beneficial for AU as a whole. He said these spaces would attract more black students to AU because it would show that they are taking diversity and inclusion efforts seriously. Only about seven percent of the class of 2022 identified as black, a number reflected in AU’s incoming Class of 2023. The Eagle has previously reported on the Hub for Organizing Multiculturalism and Equity, or HOME. The space is located on the third floor of the Mary Graydon Center and aims to be a space where students of different identities “can just come and be,” according to Fanta Aw, vice president of campus life and inclusive excellence. 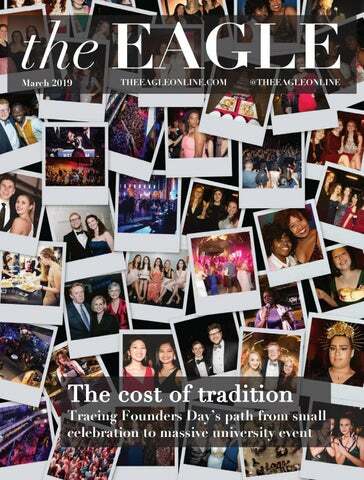 In December, The Eagle spoke with students who weren’t satisfied with the space. Complaints range from the small size of the space to how HOME has been marketed to students of all backgrounds rather than to students of color, especially for black students. “HOME doesn’t provide people with a sense of security, with a sense of belonging, when everyone from all types of affinity groups can be there,” senior Othniel Malcolm Andrew Harris told The Eagle last semester. Freeman said the next step in the process is to identify key stakeholders and find ways to engage the student body on what housing options should look like. “If we can create communities within our communities that support the needs of students, can increase opportunities for engagement and assist in helping students feel more connected and allows them to thrive academically and personally, I am all for it,” Freeman said.